This book has been written specifically for marketers. It teaches how to use AI to improve marketing efficiency. 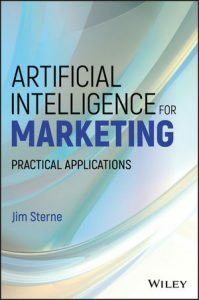 The book includes definitions of AI terms, illustrations, case studies for all marketing components: the customer journey, marketing mix, customer lifetime value, marketplace segmentation, social media engagement, merchandising, customer service , etc. Is AI So Great if It’s So Expensive? What’s All This AI Then? One Algorithm to Rule Them All? What Keeps a Marketing Professional Awake? Market Research: Whom Are We After? How Far Will Machines Go?